Great time had by all. Crew was outstanding and fun was had by all. Parasailing was out standing as all three of us were on the kite at once. They also dipped us 3 times and then back up. Had no problems at all and the pick up was on time. Worth the money. Other than our transfer driver being 30 minutes late and non-personable, this excursion was GREAT! Once on board the catamaran, we were served refreshments juice, soda, water. We tried the hooka diving which I thoroughly enjoyed...great experience! Others could snorkeled who did not care for the hooka diving. Then we were transferred by a small boat over to the parasailing boat. It was awesome sailing up so high over Bavaro Beach...so serene. We were then taken back to the catamaran and sailed off to a sandbar beach for alcoholic beverages, music, dancing, swimming and partying. The crew on board were very professional and catered to all different ages and abilities. I would recommend this excursion for those who want to try a little bit of everything in one excursion. Well worth the money! Snorkeling was cool. Snuba was way to short. The boat was way overpacked! There litterally weren't enough seats for everybody in the group to sit on the boat. I would recommend this if you don't have any other plans and arn't able to go snorkeling anywhere else. Like many other people the parasailing had to be rescheduled for another day. We've done a lot of these tours - there were good and bad with this tour. First - let me say that the people at Viator have been wonderful. The local operator is the reason for the low rating. The tour has 3 options - and all 3 options happen on the same boat with people that have paid for different levels, and I found that confusing. This is a crowded tour if it is full, and then the boat will stop at a snorkel/hookah place with lots of other boats right beside it - so the water is CROWDED. 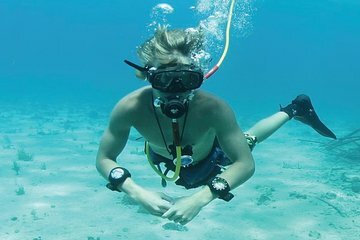 We didn't get offered the opportunity to do both snorkel and hooka - we were given an either/or option, so we felt that was misleading, as our group of 16 had expected to snorkel together. The weather prohibited parasailing on that afternoon, so our group was offered the opportunity to either reschedule parasailing for the next day, or get the picture package for free. Some of us were leaving, so couldn't reschedule, and had to take the photo option. The photos were delivered on a CD to our hotel front desk the next day. Sadly, many of the photos all of the underwater ones are of a different group than ours. The 8 people who rescheduled parasailing were stood up the next day, with no answer at the local operators phone. Our hotel concierge eventually reached the local operator and obtained another reschedule for the following day - which our people were no-showed again. We received a partial refund, covering the parasailing portion for those people, after some correspondence with Viator. However, I feel that being no-showed on vacation TWICE is worth more than the cost of parasailing. In general, if the boat were less crowded, this would be a good tour. It's a nice boat with a fun crew. If the snorkeling spot were less crowded, this could be a great tour. We hadn't been to Punta Cana before - but in general snorkeling trips tend to juggle locations or timing in order to give you the best snorkeling opportunity, and I have to wonder if there are simply no good snorkeling spots in Punta Cana, as there were 8 boats in the same location when we were there. If the tour operator had shown up for the rescheduled parasailing, I would have given this a higher rating. what a blast...staff was really nice..hooka diving was an experience!! The party cruise was a lot of fun as well. The nap on the boat back was awesome. It was so relaxing. We did the parasailing first and the boat an out of gasoline and we took a dip in the water that I was not prepared for, but it was amazing and so pretty up there. The hooka diving was great too, but if you aren't prepared for it then you will panic. I was with others that panicked when they got into the water and they could not do it. There is no training so you just get thrown into the hooka diving. The snorkeling was fun, but it was not as great that I have done before. The scenery and waters were beautiful. The snorkeling was nice but very crowded. There were many snorkeling boats meeting in one central location so it was difficult to move around freely. The party boat then took us to an area called The Shallows to swim while we were served drinks in the water. This was nice but again there were so many boats and people that you really didn't have a lot of room to enjoy the experience. Also the other boats drove in between the groups of people to their place which seemed a bit unsafe. The crew members were friendly. They played dance music, gave us directions, served drinks and navigated the waters well. The disappointing part was the parasailing. The company told us we couldn't go due to poor weather conditions, although it was a beautiful calm day with average winds and other companies were parasailing. They said we could reschedule for the following day, so we did. We waited for over an hour for the company to pick us up. They never did and they never contacted us to explain why. After many attempts to reach them, we finally did and they said they couldn't take us because of weather. Again, another beautiful day with reasonable winds. Then we tried to be reimbursed for just the parasailing part of the trip and they said they can't help us or reimburse us, so we need to take that us with Viator. Oh, and if you plan on taking small children, the party music has a lot of foul language.Okay for adults, but be warned for children. Loved it!!! Will do it again next year!!!! So fun! Definitely recommend doing! Everyone was so nice and so energetic. We did the hooka diving, parasailing and snorkeling combo and all of it was excellent!!! Hooka diving was the best and definitely recommend doing it for anyone!